While many paid tribute to Carrie Fisher’s legacy on Tuesday by sharing their favorite scenes from Star Wars or When Harry Met Sally, some fans chose to remember the actress for her work destigmatizing mental illness. According to the New York Times, MTV senior political correspondent Ana Marie Cox helped kick off the trend by writing on Twitter, “I’m pretty open about being in recovery; I’ve been more circumspect about mental illness. In honor of Carrie Fisher: I’m bipolar, too.” Soon the hashtag #InHonorOfCarrie had over 180,000 unique visitors on Twitter with many revealing their mental-health issues. 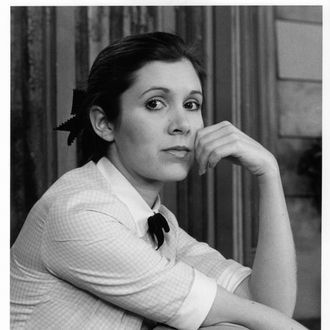 Julie DiCaro, a Chicago journalist who also tweeted on Tuesday, told the Times that Fisher made it easier to not feel so alone in her illness: “It’s comforting that Carrie, or Princess Leia — who’s cooler than Princess Leia? — was comfortable speaking publicly about her struggles. It made me feel comfortable.” Which seems like the message Fisher would have wanted, especially as she chose to present only her true self, war wounds and all, in her later years.